Applications are now open for the 2016 Carrington Youth Fellowship Initiative (CYFI). 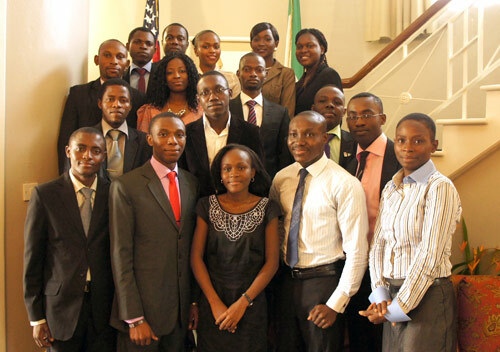 The CYFI Fellowship is a dynamic youth-based initiative launched in 2011 by the U.S. Consulate General, Lagos. CYFI brings together Nigerian youth of exceptional vision, skills and experience to design and implement projects that have a positive impact on Nigerian society. Former Ambassador to Nigeria, Walter Carrington, was a champion of civil liberties, democracy and closer ties between the U.S. and Nigeria. The fellowship seeks to develop a select group of young Nigerians into ethical and impactful leaders by connecting them with mentorship, networking, training and funding opportunities over the course of an intensive fellowship year. The CYFI fellowship is built around year-long social innovation projects that are designed by fellows and supported by the U.S. Consulate and private partners. Following successful completion of their projects, fellows remain involved with CYFI and the U.S. Consulate through the CYFI Alumni Program. The 2016 application is open to all citizens and permanent residents of Nigeria currently residing in Lagos and Port Harcourt. Prospective fellows should note that all meetings and group work for CYFI project will be conducted in Lagos and Port Harcourt. Fellows who live outside of the greater Lagos and Port Harcourt metropolitan area and are unable to attend frequent meetings with their project teams and monthly meetings with the CYFI Board, in Lagos, will not be considered for the fellowship. NOTE: Applicants selected for an interview will be notified by the CYFI Board. Interviews will be held at the U.S. Consulate General in Lagos.